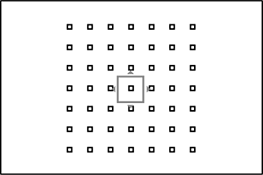 Rotate the focus mode selector to S or C ( Focus Mode). 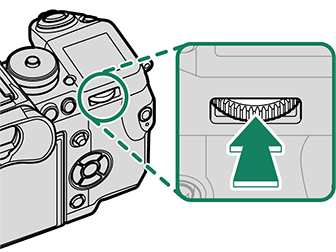 Use AF/MF SETTING > AF MODE to choose an AF mode ( Autofocus Options (AF Mode)). 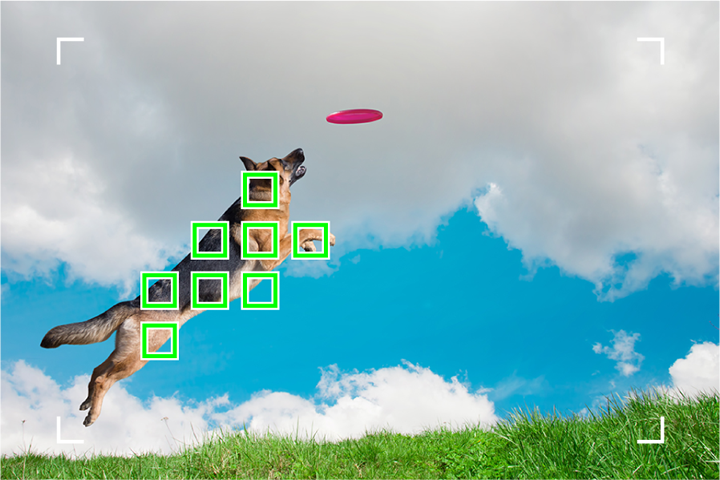 Choose the position and size of the focus frame ( Focus-Point Selection). 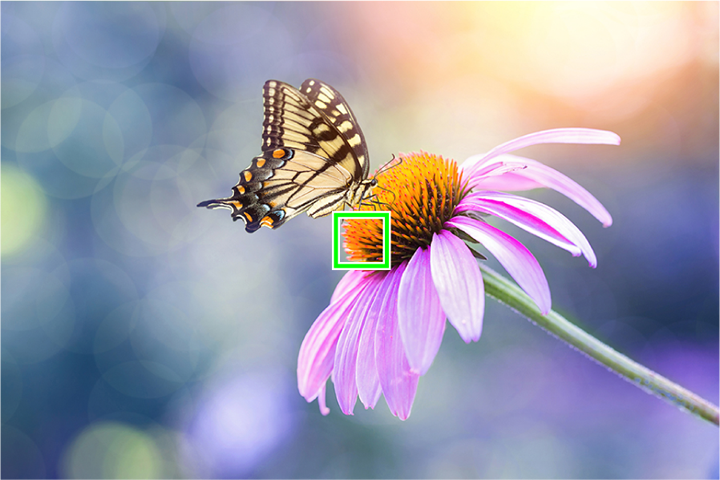 Use the focus mode selector to choose how the camera focuses. Single AF: Focus locks while the shutter button is pressed halfway. Choose for stationary subjects. Continuous AF: Focus is continually adjusted to reflect changes in the distance to the subject while the shutter button is pressed halfway. Use for subjects that are in motion. Eye-detection AF is not available. Manual: Focus manually using the lens focus ring. Choose for manual control of focus or in situations in which the camera is unable to focus using autofocus ( Manual Focus). 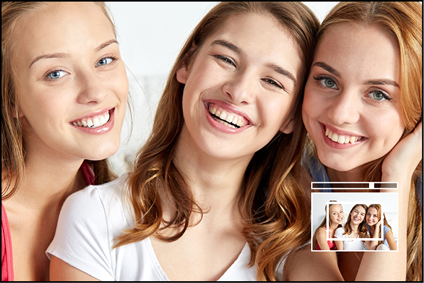 Regardless of the option selected, manual focus will be used when the lens is in manual focus mode. 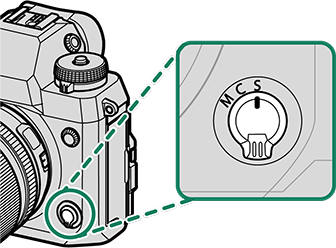 If ON is selected for AF/MF SETTING > PRE-AF, focus will be adjusted continuously in modes S and C even when the shutter button is not pressed. 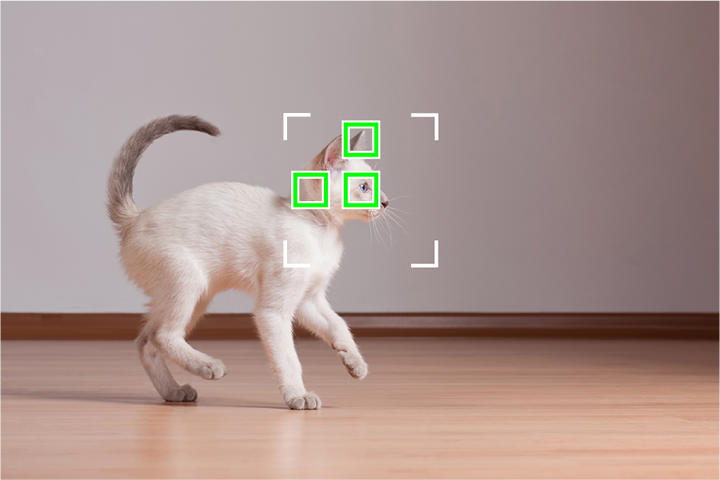 The focus indicator turns green when the subject is in focus and blinks white when the camera is unable to focus. 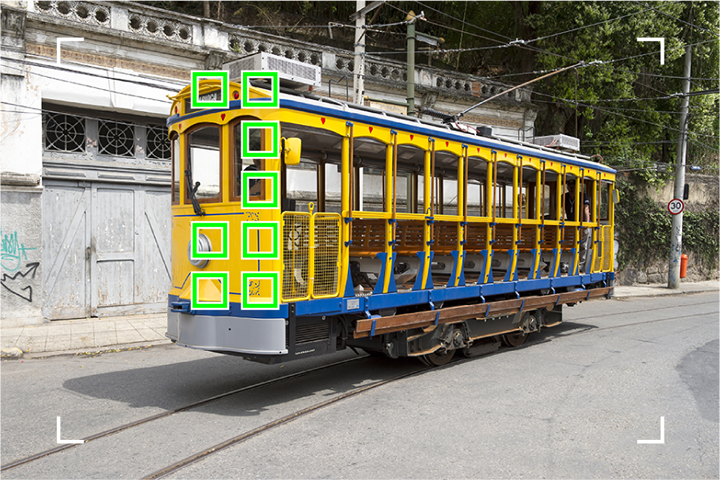 Brackets (“( )”) indicate that the camera is focusing and are displayed continuously in mode C. is displayed in manual focus mode. 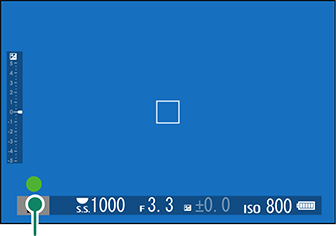 Choose how the camera focuses in modes S and C.
Press MENU/OK and go to the shooting menu. Select AF/MF SETTING > AF MODE. This feature can also be accessed via shortcuts ( Shortcut Options). How the camera focuses depends on the focus mode. Camera focuses on subject in selected focus point. Use for pin-point focus on selected subject. Camera focuses on subject in selected focus zone. Focus zones include multiple focus points, making it easier to focus on subjects in motion. 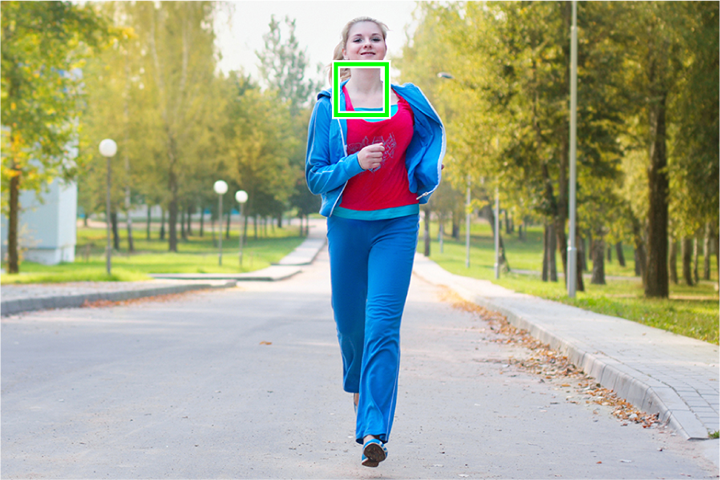 Camera focuses automatically on high-contrast subjects; display shows areas in focus. Rotate the rear command dial in the focus-point selection display ( Selecting a Focus Point, The Focus-Point Display) to cycle through AF modes in the following order: SINGLE POINT, ZONE, and WIDE. Focus tracks subject at selected focus point. Use for subjects moving toward or away from camera. Focus tracks subject in selected focus zone. Use for subjects that are moving fairly predictably. Focus tracks subjects moving through wide area of frame. 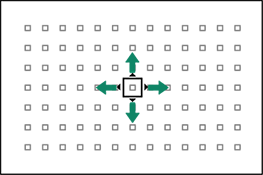 Rotate the rear command dial in the focus-point selection display ( Selecting a Focus Point, The Focus-Point Display) to cycle through AF modes in the following order: SINGLE POINT, ZONE, and TRACKING. 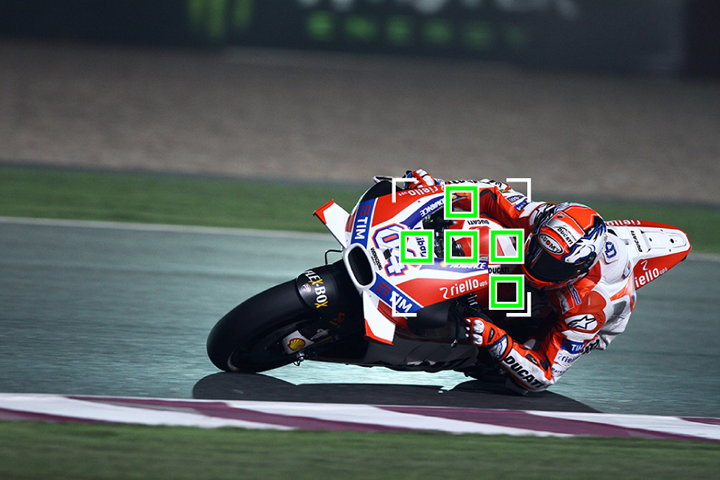 Choose a focus point for autofocus. Select AF/MF SETTING > FOCUS AREA to view the focus-point display. 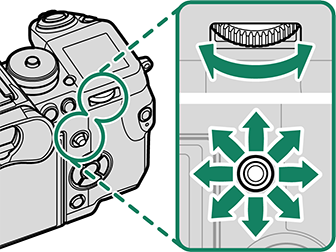 Use the focus stick (focus lever) and rear command dial to choose a focus area. The focus point can also be selected using touch controls ( Shooting Touch Controls). 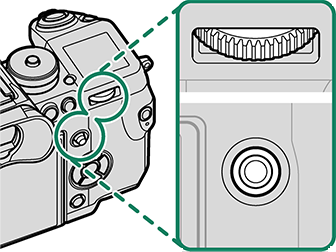 Use the focus stick (focus lever) to choose the focus point and the rear command dial to choose the size of the focus frame. The procedure varies with the option selected for AF mode. Manual focus-point selection is not available when WIDE/TRACKING is selected in focus mode S.
If ALL is selected for AF mode, you can rotate the rear command dial in the focus-point selection display to cycle through AF modes in the following order: SINGLE POINT (6 frame sizes), ZONE (3 frame sizes), and either WIDE (focus mode S) or TRACKING (focus mode C). 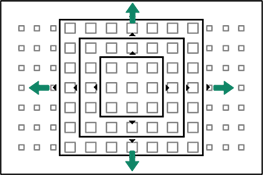 The focus-point display varies with the option selected for AF mode. 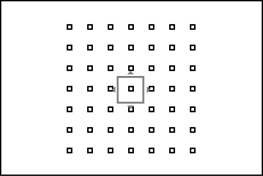 Focus frames are shown by small squares (□), focus zones by the large squares. Number of points available can be selected using AF/MF SETTING > NUMBER OF FOCUS POINTS. 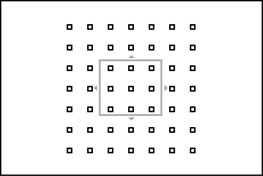 Choose from zones with 7 × 7, 5 × 5, or 3 × 3 focus points. Position focus frame over subject and press MENU/OK. 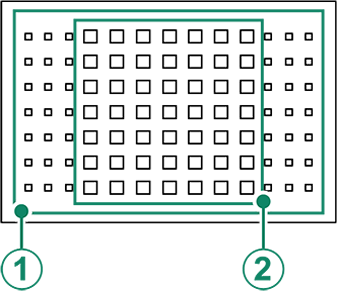 TTL contrast-detect AF offers more focus points ( ) than intelligent hybrid AF ( ), which combines phase-detection with TTL contrast-detect AF. 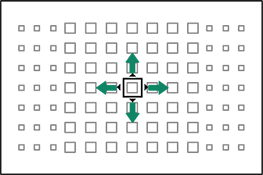 When continuous high-speed (CH) is selected for drive mode, the number of focus frames available in focus mode C drops. To zoom in on the current focus area for precise focus, press the center of the rear command dial. Use the focus stick (focus lever) to choose another focus area. Press the center of the rear command dial again to cancel zoom. In focus mode S, zoom can be adjusted by rotating the rear command dial when STANDARD or FOCUS PEAK HIGHLIGHT is selected for AF/MF SETTING > MF ASSIST ( MF ASSIST). Focus zoom is not available in focus mode C or when AF/MF SETTING > PRE-AF is on or an option other than SINGLE POINT is selected for AF MODE. Use BUTTON/DIAL SETTING > FUNCTION (Fn) SETTING to change the function performed by the center of the rear command dial or assign its default function to other controls ( Assigning Roles to the Function Buttons).